Hi everybody! I'm trying out a new segment, Current Obsessions, where I tell y'all about a few things that I am currently obsessing over, not necessarily food related! Sandra and I recently got into One Day at a Time, and binge-watched both seasons on Netflix over two weekends. It's a remake of the 1970's sitcom of the same name, this time featuring a Cuban-American family. Structurally, it's an old-school multi-cam sitcom with a laugh track, but it feels really fresh, dealing with very current issues. And I personally love watching a show that centres around a minority family and doesn't portray them in a stereotypical way. It manages to be both laugh-out-loud funny and deeply moving - I'm not ashamed to admit that I cried more than once, especially during the second season. 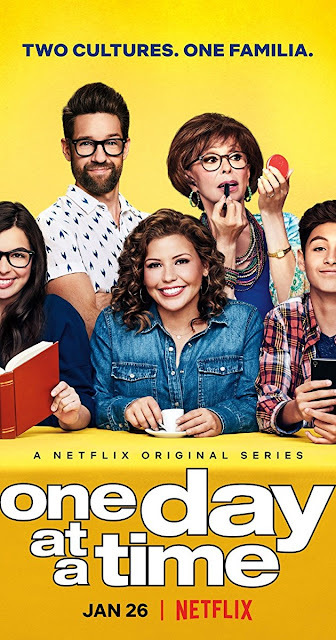 All the performances are fantastic, especially the lead Justina Machado, and especially the legendary Rita Moreno as Lydia, the irrepressible abuelita. I had no idea she was still working and performing, and was absolutely thrilled when I saw her name in the opening credits. She is sassy beyond belief and totally steals the show! I highly recommend this series! Will most likely be cooking a lot more Cuban food in the near future. Watch this space. 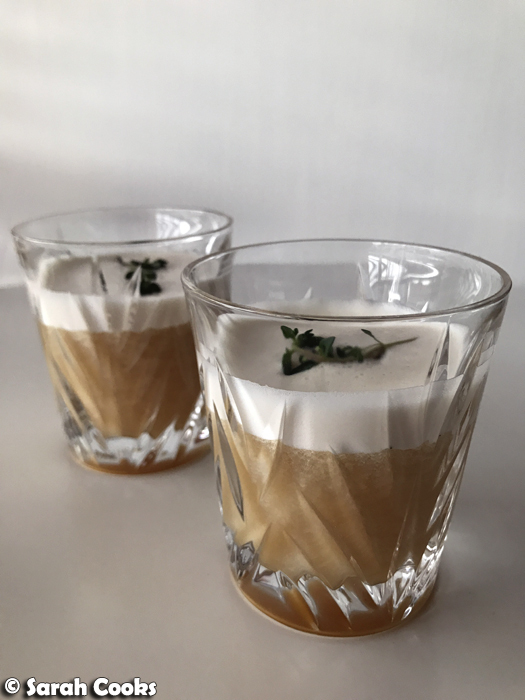 I made this maple & thyme whiskey sour from Brooklyn Homemaker and it was totally delicious! I'm not much of a cocktail-maker (although I am certainly a cocktail drinker), but I saw this on Pinterest, happened to have all the ingredients and thought I'd give it a go. It tasted gorgeous - smoky, sour, foamy and herbaceous. It looked and tasted like a proper cocktail from a fancy bar - would definitely make again. 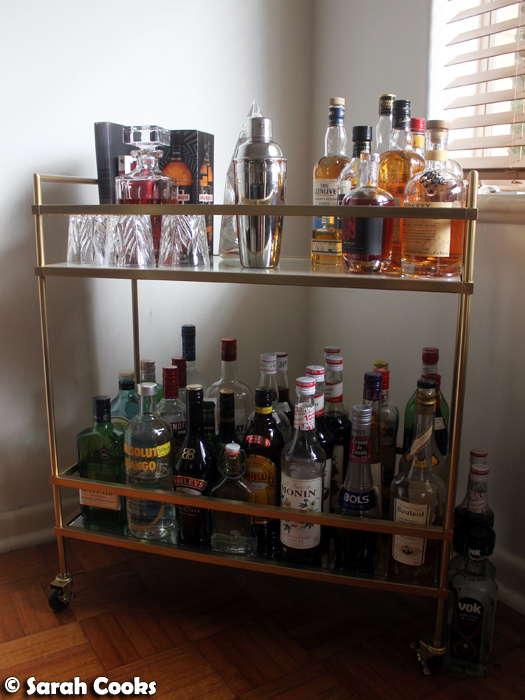 And speaking of cocktails, I'm totally in love with my new West Elm Terrace Bar Cart. (Definitely NOT sponsored, paid for with my own hard earned money). I am terrible at home decorating, and hitting up Ikea or Bunnings is my idea of torture. In fact, if it were up to me, my flat would still be filled with the most basic of Ikea furniture, and to be perfectly honest, the cardboard boxes would still be lying around. However, Sandra is great at home stuff, and always has great ideas for fixing up the flat and making it more homely. (She also, importantly, has the efficiency and determination to make her ideas happen. I usually help by driving us around and staying out of her way). Late last year, I suggested in a vague way that it might be nice if we refreshed our (crowded and dark) dining room, which had really become more of a storage space. Sandra immediately sprung into action, researching options, breaking down the old el-cheapo Ikea furniture, organising for it to be given away, planning and purchasing and assembling the new pieces. It was mainly West Elm, because we are fancy ladies and felt like splurging. I managed to convince her that a bar cart was a very necessary addition to our new fancy-pants dining room, and here it is! Time for lots of dinner parties with mood lighting and soft jazz. (PS we are still searching for the right dining table, and once that's done I'll share some photos of new new dining room, because I LOVE IT). Flamingos. 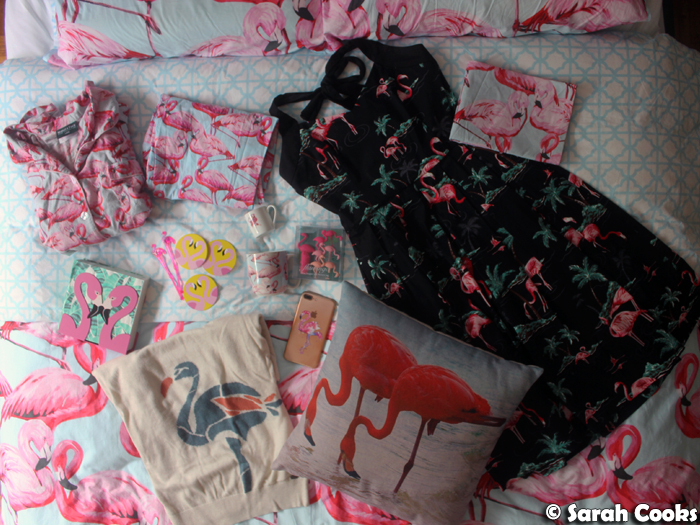 My flamingo obsession has shown no sign of abating over the past year. I know, very basic of me, seeing as flamingo stuff is everywhere now, especially in post-Christmas bargain bins, but I can't help it. They are the most fabulous of all the birds! My flamingo accessories currently include: phone cover, espresso cup, cushion, napkin holder, cocktail stirrers, dress, jumper, shower cap, gold flamingo statue, wine-stopper, and almost the entire range of Morgan and Finch flamingo homewares and apparel from Bed, Bath n' Table. (These include both summer and winter PJs, a tea towel, mug and bedsheets). In my defence, a lot of these were gifts from people who know I like flamingos, and in my other defence, my friend Adri is also obsessed with flamingos and she owns more of the Morgan and Finch flamingo range than I do (she's got the robe and slippers too) so I think it's clear that I'm not the one with the problem. Ahem. Finally, pink dragonfruit! It's ridiculously expensive, but I can't help but be drawn to the vibrant magenta colour. (And it also conjures up happy memories of holidays in Bali and Cairns). 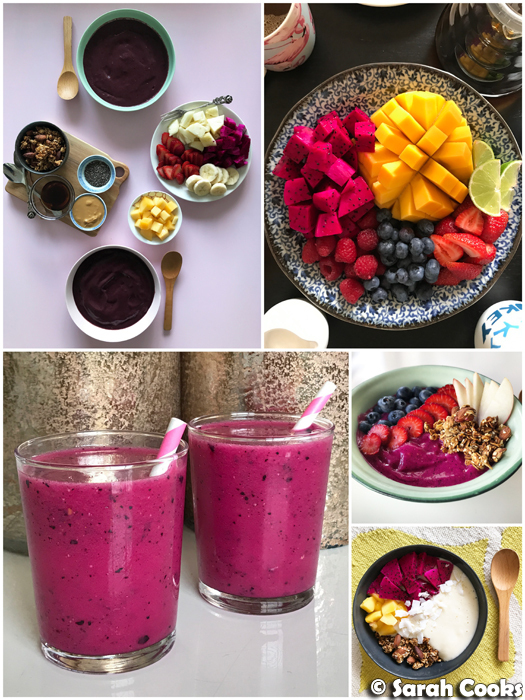 I've got a couple of packets of frozen pink dragonfruit (AKA pitaya) purée in the freezer that I use for the occasional smoothie bowl, and I've noticed that the fresh ones have started appearing in the shops. (Remember to check or ask if you've got a red one or a white one; they look pretty similar from the outside). For anyone who hasn't tried them, the taste is quite mild, rather like a sweet melon. They certainly don't taste as intense as they look! Here they're usually about $10 for one (eep! ), so whenever I do splash out on one, I treat it like a precious jewel - carefully peeling it and chopping a quarter at a time, and enjoying it for breakfast or a snack. I carefully keep the rest in a ziplock bag in the fridge, ready for the next meal. And if I can't get through it all in a couple of days, I chop it up and freeze it, so that there's no wastage, and so that a bright pink smoothie is only a moment away.